3 Week Nails is the original and only Power Polish service, with 21+ days of superior color. New, patent-pending UV3 Technology combines the ease of nail polish with the performance of gels. A true innovation in chip-free, extended wear nail color. Wash and sanitize your hands. Clean nail plate and remove excess oils. Tips: Starting with a clean surface will make sure the 3 Week Nails polish stays on for the full 21 days. These steps are important to make your manicure long-lasting and flawless! Use a lint free wipe to clean your nail plate and be very gentle when handling your cuticles. Apply one thin layer of 3 Week Nails Base Coat. Tips: The thinner the better! This is key with gels. Unlike nail polish where you can add a more generous layer, with 3 Week Nails you want to apply very thin layers. This will ensure correct application. The 3 Week Nails Base Coat only needs to be cured for 2 minutes, so keep that in mind. 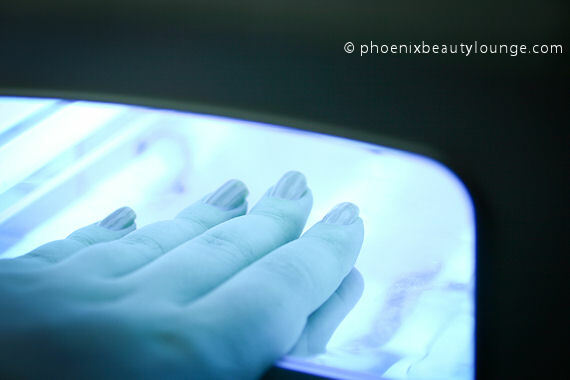 Even though UV lamps are NOT harmful to the skin, there’s no need for unnecessary prolonged exposure. Apply one thin coat of 3 Week Nails Color. Cure under UV lamp for 2 minutes. Apply a second coat of 3 Week Nails Color. Tips: Your color also needs to be applied in thin layers. When applied correctly, it will look semi-sheer. Don’t worry, this evens out after the second coat. The color is cured for 2 minutes. Apply color to one hand at a time. If you are working on someone else, you can continue painting while one of the hands is under the UV lamp. Apply one thin layer of 3 Week Nails UV Top Coat. Remove top film with 99% Isopropyl Alcohol. Apply cuticle oil to all fingers. Tips: To ensure maximum wear, you need to apply a UV gel top coat. This will make your nails look extremely shiny! Make sure to cap the free edge of the nails to make them last even longer. Once you are finished, 3 Week Nails will be strong and hard from curing. No need to worry about denting your fresh manicure! Remove the sticky inhibition layer with a lint free wipe and 99% Isopropyl Alcohol. Make sure to add some nourishing cuticle oil to the nails when you’re finished. Your nails will look stunning! 3 Week Nails is a great choice if you want your nails looking flawless for Three weeks and not worry about chipping. It’s a high quality product and you can tell! The 3 Week Nails system won’t disappoint. They recently added a brand new Aumumn 2013 collection called Dare to Dream with 6 new 3 Week Nails colors. Make sure to check them out on our site!